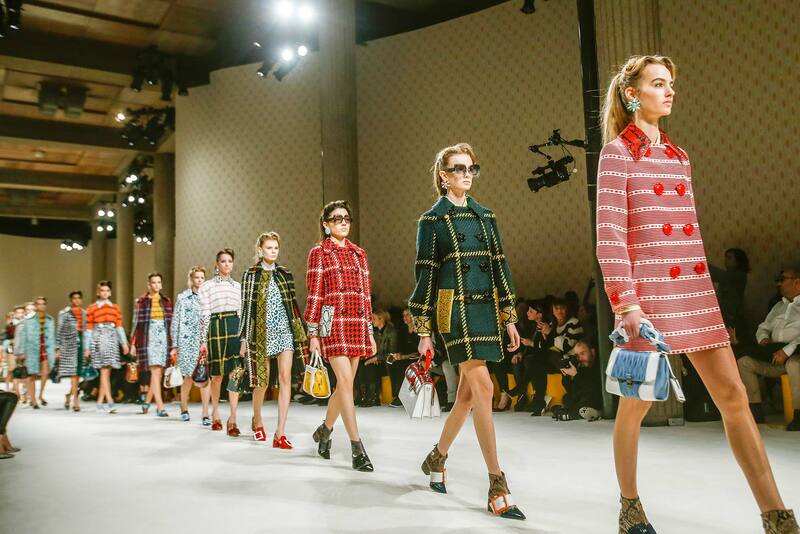 This week for Fashion Crush Friday we examine a relatively new label on the fashion scene: the rebelliously real, Miu Miu. The luxury label is an offshoot of Prada, and slightly less expensive. It has not been a hot media topic and there are no known collaborations in the near future. However, by offering a different perspective and with the support of Prada, the brand has potential to be one of the greatest luxury brands today. In its earliest collections, the brand was clearly an extension of Prada, this was during the years of Prada’s simple and clean design. However, once the brand matured, it developed its own voice, referencing as many as four different decades in a single collection. 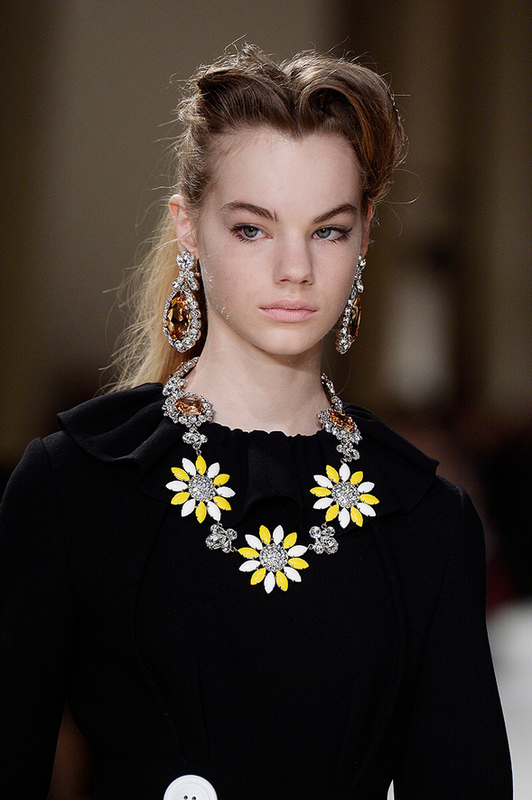 Unlike Prada, the brand focuses more on apparel and ready-to-wear rather than accessories like its parent company. Despite being so new, the brand has easily gained recognition from bloggers and heads of the fashion industry. Their past campaign models include the likes of Natalie Westling, Lupita Nyong’o, Elle Fanning, and Elizabeth Olsen. That lists now includes budding model Estella Boersman whose sophisticated and girlish charm provide an excellent match with the brand’s aesthetic. The latest show had references from the 1950s, 60s, 70s, 80s and 90s, through its dress styles, accessories and patterns. Many of its most recent shows remind audiences of a Wes Anderson film, highly stylized and nostalgic. Pronunciation: Mew-mew. The name of the brand is a family nickname for Miuccia Prada. Creative Director: The brand began in 1993 by Miuccia Prada, fashion royalty, who is also the co-CEO with her husband, Patrizio Bertelli. 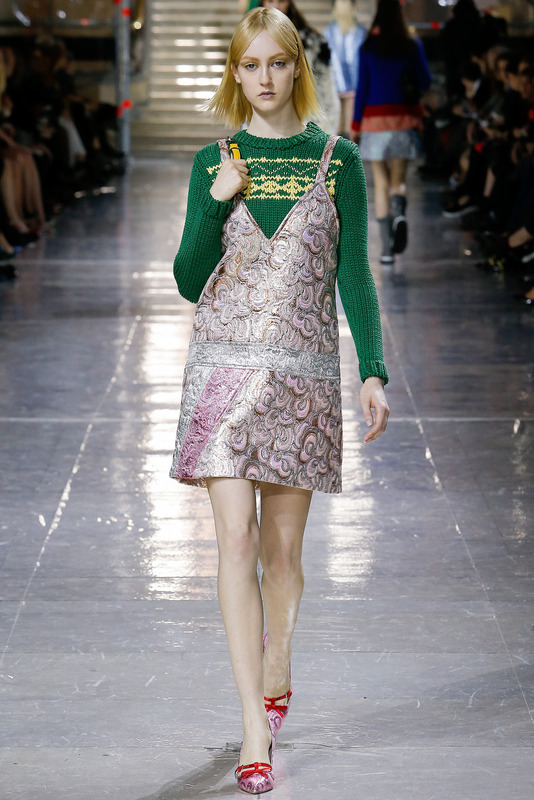 Design Aesthetic: Prada was once dubbed “ugly chic” which is now a term given to Miu Miu. The brand achieves this by juxtaposing elements of masculinity and femininity alongside sophistication and innocence. The brand highlights youth culture through its rebellious yet modern attitude. Signature Items: Their “It” bags include the Madras bag and the Matelasse bag. They frequently accessorize ensembles with bright and large jewelry and pair socks with high heels. They emphasize the manufacturing processes with highly synthetic looking leather and bright animal prints. Above all the brand feels real in that it is wearable and not pretentious. The highly stylized looks thrust audiences into another time. They break the rules by combining multiple prints and colors that in the hands of most designers would feel forced and overwhelming. 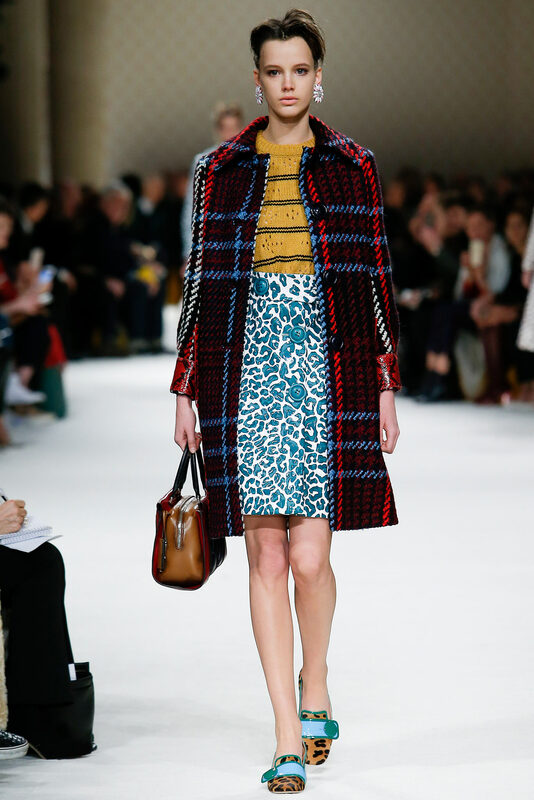 However, with Miuccia Prada, they all just make sense.